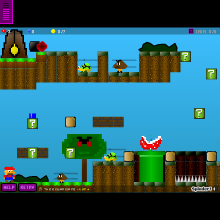 Game review: Mario Epic Adventure. Is It Truly Epic? Mario Epic Adventure. Is It Truly Epic? Today I will be reviewing Mario Epic Adventure by Liamnight. Liamnight has made some good games in the past and I knew that I wasn’t going to be disappointed by playing this one. I saw that it was featured and that gave me the incentive I needed to play. This was also one of the first games created with graphics. Was I going to be tremendously disappointed? Or would I enjoy Mario Epic Adventure? Mario Epic Adventure was by far the most interestingly captivating game that I have played on Sploder. This game follows a plot that isn’t really explained well, or at all. You just instinctively know that you should collect coins and get to the door at the end of the level. That pretty much explains the entire layout of all the levels. The While it might seem rather lame, it is actually nice and entertaining. It was entertaining to play a fan-made Mario game from someone like Liamnight. It was nice to see graphics that were basically “fan-art,” yet maintained a sense of artistic liberty. The graphics were very interesting, to say the least. Liamnight’s creations might seem simplistic, but they deliver a subtle hint of original flavor to a game based on another game’s main character. “What do you mean, Lumberjay?” You might ask. What I mean is that the Mario in the game isn’t based off of a sprite, nor is the trademark koopa troopas, goombas, etc. They are all different as opposed to what you might expect, or at least what I was expecting. These graphics also helped out with the scenery. While this game was a refreshing Mario styled game, it did not come with some faults. I noticed that the gameplay was rather simplistic and repetitive. Simply jumping on your turtle and mushroom adversaries gives you the sense of Mario-like gaming, but it can be a tad boring after a while. Sure the change of scenery and enemies might occur, but the playing style will stay the same. Not to say it is a bad thing, but I feel like more could have been done with level changing. The plot wasn’t very well explained either. You simply collect the coins, go through a door, and BOOM! You’re at the next level. A nice puzzle or two could have been a great addition to this game as well. As unfortunate as some of the downsides may seem, it doesn’t take away from the fact that this is a good game. The gameplay was decent, the graphic were cartoony and fun, and the scenery was fairly clever. I was glad that I stumbled upon such a unique twist of everyone’s favorite coin collecting plumber. I just felt like this game had your classic platforming elements, and delivered on them rather well, in my opinion. It was a little repetitive at times, but gave me the feeling that Mario games tend to bring out. It Mario Epic Adventure stayed true to most platforming elements. Let’s face the fact that this game is original in style and design, but is essentially Mario themed gaming. I loved the creativity used in character design, but Mario Epic Adventure just isn’t very creative altogether. I know I shouldn’t judge on creativity when it is based on another game character, but to me, creativity is what makes games great and fun to play. This was only semi-creative, unfortunately. Sadly, the game isn’t very addictive. I am a Mario fan at heart, but I just found that the game doesn’t really hold my attention very well. The repetitive level styles and enemies just harmed my gaming experience. Not to say it isn’t good, it just failed to get me into it. Challenge is perhaps the part of games that I adore the most. It’s the factor that decides if you are good enough to continue. This game certainly had a fair amount to it. Whether it was jumping over enemies, evading fireballs launched at you, or watching out for pit traps that look like safe landing spots, there was enough challenge to make me enjoy playing. Although it could have been a little harder, I feel like it was fairly challenging. Scenery is very important in games. Nobody would want to play a game that has objects that just don’t make sense. Mario Epic Adventure displayed scenery very well. Whether it is the Koopas and other enemies, or the nice wintery coating to objects in snow levels, this game showcases a nice variation of scenic areas. It made me feel as if I were in the Mario world inside Liamnight’s brain. This game was a nice personal adaption of a classic game series. I had high hopes for this game, but it didn’t meet the credentials of being what I’d consider to be a truly worthwhile game. I would recommend this game to anybody looking for a nice taste of Mario any day. I had tremendously hoped for an epic adventure, but instead received a great adventure. While I am disappointed, it is not by much. Feel free to play this great game. With all the ups and downs of Mario Epic Adventure, It must be realized that a lot of work was put into it. Could it have been better? Of Course. Could it have been worse? Substantially. I am glad that this game was featured, because it is an excellent game, but had some room to improve.